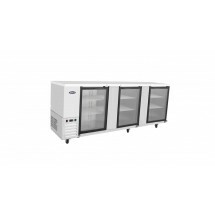 Atosa MBB90G Glass Door Stainless Steel Back Bar Cooler 90"
TigerChef > Browse by Store Type > Bar Supplies > Bar Equipment >< Back Bar Coolers > Atosa MBB90G Glass Door Stainless Steel Back Bar Cooler 90"
$2,646.91 Turbo Air TBB-4SB-N 3-Section Solid Door Black Back Bar Refrigerator 90"
$3,047.81 Turbo Air TBB-4SG-N 3-Section Glass Door Black Back Bar Refrigerator 90"
$5,120.99 True TBB-4PT-S Stainless Steel Pass-Through Back Bar Refrigerator 90"
$4,301.99 True TBB-4G-S-LD Stainless Steel Glass Doors Back Bar Refrigerator with LED Lighting 90"
$4,064.99 True TBB-4PT Stainless Steel Pass-Through Back Bar Refrigerator 90"
$3,931.99 True TBB-4-S Stainless Steel 3-Section Solid Doors Back Bar Refrigerator 90"
$3,486.99 True TBB-4G-LD 3 Section Glass Doors Back Bar Refrigerator with LED Lighting 90"
$3,056.99 True TBB-4 3-Section Solid Doors Back Bar Refrigerator 90"
$3,573.99 True TBB-24GAL-60G-S-LD Stainless Steel 2 Section Glass Door Back Bar Refrigerator 60"
Perfect for restaurants, bars and other food service facilities, the Atosa MBB90G Glass Door Stainless Steel Back Bar Cooler 90" features a professional and functional design that will complement a variety of settings. 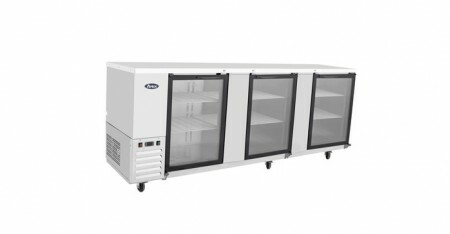 This bar cooler is equipped with 3 glass doors which will showcase your bottled and canned beverages. 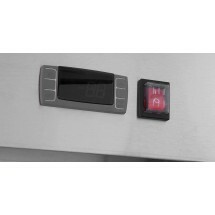 Thanks to its NSF approved flexible magnetic door gaskets, the doors of this cooler close automatically to save on energy. Built with a heavy-duty Embraco compressor, this piece offers a reliable cooling system for your bar drinks. 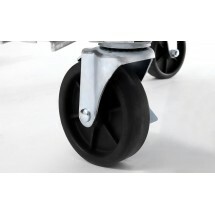 For added convenience and maneuverability, this bar cooler has pre-installed swivel casters with bumper and brakes. Dimensions: 89.3" x 28.1" x 42.2"